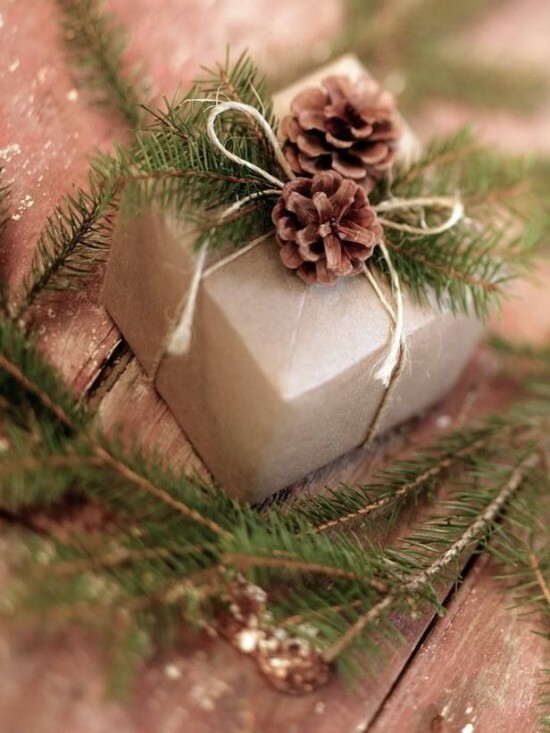 Have you ever envied someone else’s fabulously wrapped gifts or flipped through a magazine staring at the beautifully wrapped packages all nestled under the tree and wondering how they do it? Just like all design, the interest is in the details. It’s all about adding layers and varying textures to create interest. 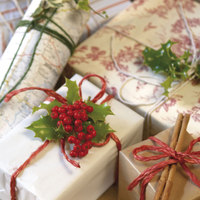 It’s about the ‘little extras’ that make very simply wrapped gifts seem extra special. I love the idea of starting with an inexpensive, solid base and adding personality with a few printed papers and creative embellishments! A few years ago, I invested in an enormous roll of brown kraft paper, including the industrial roller/cutter that you see at most department stores! 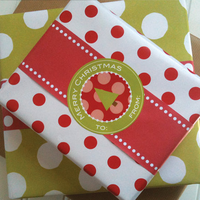 I use it year-round with a variety of ribbons, bows, and other special elements to give each package it’s own personality without having to store multiple rolls of partially used gift wrap; plus, I can always tear the perfect-sized sheet! Having the brown kraft paper for a base, I often tend to use a more natural, rustic approach. There are countless ways you can achieve this look – just look to nature for inspiration! Use natural fiber ribbons, such as twills, jutes, burlaps or cotton twine all in neutral tones. Try adding pine cones, cinnamon sticks, rosemary sprigs, holly twigs, or spruce and pine cuttings from your local tree farm as gift toppers. These will add dimension, texture and even some wonderful scents! Layering packages with ribbons and embellishments can make even a simple, rustic design feel unique and sophisticated. If you prefer to have more of a pop of color under your tree, then go bright and cheery with a contemporary spin on the Christmas color palette. Mix up the traditional red and green with splashes of bright pinks, limes and oranges – don’t be afraid of bold colors and patterns (think stripes or polka dots!). Layer strips of printed paper over a solid paper base for a “ribbon” effect and top it off with coordinating tulle, thinner ribbons, or even pom pom fringe. 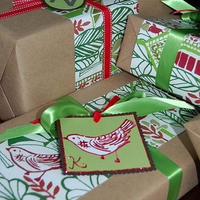 A bright ornament or even colorful feathers can dress up your package and add the perfect finishing touch to this fun take on holiday wrapping. When you want a more luxurious, elegant feel, try a solid black, white or metallic base paper, layered with coordinating ribbons in velvet textures or beaded edges. Add layers of gold, silver, copper or bronze ribbons, shimmery accents, and glittery toppers for the ultimate sophistication. One key to this look is keeping it neat and simple, not overdoing it, and aiming for a flawless finish (even using double sided tape for a completely clean, crisp look). While I love the idea of every gift under the tree coordinating perfectly, it’s not always practical and can make sorting presents for delivering very cumbersome. With that in mind, a few years ago, I began wrapping all of our gifts in the brown kraft paper, but varying the ribbons and embellishments based on certain groups of friends or family members. I use one type of ribbon for packages going with us out of town to visit my husband’s family and another for those traveling with us locally to my family’s celebration. I use a little brighter color scheme for the ones for our immediate family (including our kids) and more unique, personal touches on the gifts that we hand out to family and friends throughout the season. All of the packages coordinate beautifully under the tree, but with the color-coded ribbons allow us to easily grab the gifts we need when we are loading up the car to head out to various holiday celebrations. We can quickly grab any packages we need for a family road trip or holiday dinner with friends and aren’t crawling around, trying to read name tags by the light of the tree as we search!